We have a lot of toothbrushes. 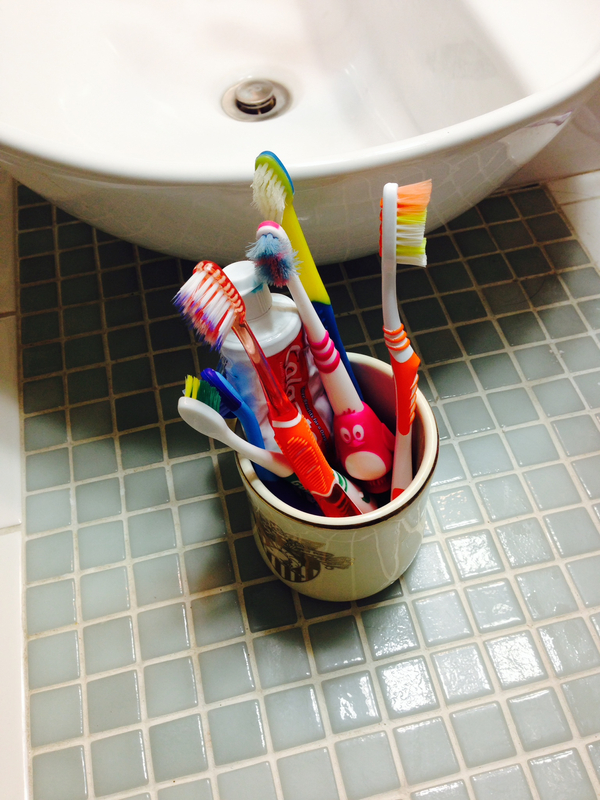 Even though only five of us have teeth, I counted six near my bathroom sink alone. I did not count the sandy one in the bathtub or the blue one on the floor. My brush is yellow. It is often damp when I reach for it before bed. I never thought much about this, until tonight, when I glanced in the bathroom and saw Katie loading it up with paste. “Hey, that’s my toothbrush!” I yelled. Katie shrugged, “Maybe a month or two.” Then she turned away and started brushing. I’m not sure what bothered me most: that she had been using it for so long or that I hadn’t noticed until now. Guess I’m using the one on the floor tonight.